Christmas time is quickly approaching. Knowing how hard it is to shop for some of the loved ones on your list, I know you probably give out gift cards. I know I give them out. The nephews are so hard to buy for. I never know what to get them. This is a great way to dress up the gift cards you give. I just love the Santa's List stamp. I started with a piece of 4 1/2 x 11 inch Read Red Cardstock. I punched one inch in from the side with the Envelope Punch Board, turned the paper and punched again. I stamped the image with Black StazOn and trimmed it down. I then matted with Wild Wasabi Cardstock. I scored the bottom of the cardstock at 1 3/4 inch and used wet glue to seal the sides. I folded the cardstock over to meet the bottom and creased it with my bone folder. I attached a 1/2 inch strip of Season of Style DSP to the bottom. I attached the image to the top. I measured the inside of my card and cut a piece of Whisper White Cardstock to stamp my sentiment on. I stamped and attached the sentiment to the inside of the card. The oval stamp is from a retired stamp set. 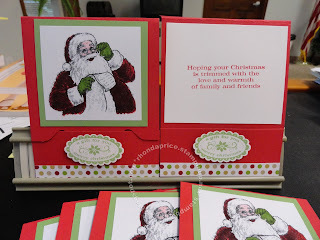 Labels: Cards, Christmas, Christmas Messages, Santa's List, Stampin' Up! This is stunning, your hard work shines through!